Upgrade the landscape to maximizing its available seating with these bollard style park benches. 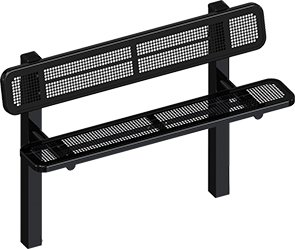 Designed for all-season installations, starting with precision 5/8" punched hole steel seats, 3" comfort smooth edges and ultra-resilient polyethylene finish. The bollard style frame is engineered with a bold 4" square posts, heavy-duty MIG welded, 2-3/8"O.D. seat support arms. The frames are finished in durable corrosion and impact resistant powder-coating. In both 6' & 8' lengths, models are available in surface and in-ground mount styles.